Why are prenatal visits important? Since each pregnancy is different, it’s important to arrange prenatal care as soon as you know you’re pregnant. Regular prenatal visits allow Dr. Garofalo to monitor your health and the progress of your pregnancy. If there is a problem, regular visits can help identify it quickly. If all is going well, prenatal visits can help reassure you and educate you about what is going on with your body and your baby. Dr. Garofalo recommends a brief office visit for confirmation of pregnancy as soon as the last menstrual period is missed or when a home pregnancy test is positive. Any bleeding or significant abdominal pain prior to six weeks of pregnancy should be promptly reported. A comprehensive initial prenatal visit (see next section) is usually conducted between six and eight weeks from the first day of the last menstrual period. What should I expect in early prenatal visits? Lab tests usually include a Pap, blood type, STD testing, thyroid function, Rubella and Hepatitis immunity, HIV, anemia tests, and blood sugar. Throughout your pregnancy, most prenatal visits will include checking your weight, blood pressure, and the height of your uterus (to measure fetal growth). A urine test will be used to check for bacteria, sugar and protein levels. Dr. Garofalo may also check your face, ankles, feet and hands for signs of swelling. In later visits, Dr. Garofalo will check the position of the fetus. 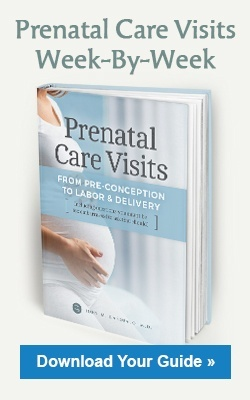 How often will I see Dr. Garofalo for prenatal visits? The frequency of prenatal visits will depend on your health and your specific condition. In ideal circumstances, you should expect to have a checkup every four weeks after your first prenatal visit for the first 28 weeks of pregnancy. From week 28 through week 36, checkups are usually held every two or three weeks. From week 36 until you give birth, checkups are usually weekly. Before you give permission for any test or treatment, be sure to ask what it is for, why it is needed, and the risks, benefits and any other options. Remember that trust and ongoing communication are very important in keeping you comfortable with your prenatal care and your pregnancy. What are my options in planning my baby’s birth? You have many options available for your baby’s birth and after-delivery care. Dr. Garofalo can discuss your preferences and options with you, including the following.